HD 149026b is a sweltering 3,700 degrees Fahrenheit (2,040 degrees Celsius), so hot that astronomers believe it is absorbing almost all of the heat from its star, and reflecting very little to no light. Objects that reflect no sunlight are black. Consequently, HD 149026b might be the blackest known planet in the universe, in addition to the hottest. The hottest planet ever discovered is charcoal black and makes even some stars seem cool. Scientists think the exoplanet absorbs nearly all the starlight that reaches its surface and then reradiates it back out into space as heat. Called HD 149026b, the feverish world emits so much infrared heat that it glows slightly. "It would look like an ember in space, absorbing all incoming light but glowing a dull red," said study leader Joseph Harrington of the University of Central Florida. Located 279 light-years away in the constellation Hercules, HD 149026b is a so-called hot Jupiter, a giant gas planet that orbits very close to its star. It is a scorching 3,700 degrees Fahrenheit (2,040 degrees Celsius), three times hotter than Mercury and hotter than the coolest stars. The finding is published online in the journal Nature. Until very recently, HD 149026b was also the densest planet known. It contains higher levels of heavy elements-those other than hydrogen and helium-than all of the planets in our solar system combined, and its core might have up to 90 times the mass of the Earth. 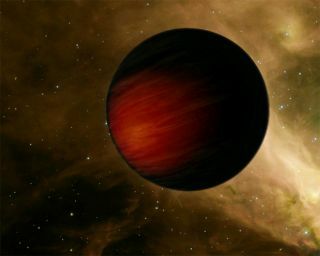 HD 149026b is a so-called "transiting" planet, meaning its orbit takes it directly in front of its star as seen from Earth. Using NASA's Spitzer Space Telescope, Harrington and his team measured the total light emitted by the planet-star system and used the information to calculate HD 149026b's temperature. "We did those observations in 2005, and it's taken us two years to make sure that we believe them, which we do," Harrington told SPACE.com. How HD 149026b got to be so hot is a mystery. "We've actually done a lot of work to try and answer that question, but the more we think about it, the worse it gets," Harrington said. One idea, proposed by Jonathan Fortney at NASA Ames Research Center in California, is that the planet is so hot that metals such as titanium and vanadium can exist in their gaseous forms in the planet's atmosphere. Such metals are "very, very, very strong visible [light] absorbers," said Fortney, who was not involved in the new study. Fortney also pointed out HD 149026b orbits a very metal-rich star, which could explain why the planet is so abundant in heavy elements. The planet's "atmosphere is probably enhanced in metals compared to most other planets, so it's probably more efficient at absorbing stellar light than other hot Jupiter planets," Fortney said. Fortney thinks HD 149026b could be the first of a new subgroup of hot Jupiters. "I think what we'll eventually find is that hot Jupiters may end up falling into two classes," he said. One class, Fortney said, would consist of relatively "cool" hot planets, in the range of about 1,300 to 2,000 degrees Fahrenheit (700 to 1,000 degrees C), and the other would have planets with temperatures of 3,000 degrees Fahrenheit (1,700 degrees C) or higher.